Sometimes I look at Christmas as a competition. Who can come up with the absolute best Christmas gift idea? Each year, I want to give gifts to my family and friends that are different, unique, and handmade. Personally, I feel that DIY Christmas gift ideas are great because they’re unexpected. They’re off the beaten path. Anyone can go out and buy that hot new video game or movie release for a friend. It’s easy. That friend can probably even buy said gift for him or herself, too. Homemade Christmas gifts, however, are one of a kind. No two are alike, and giving the gift of something homemade is a feeling akin to sharing a moment together. What could have been a simple movie purchase from the store is a sensation that’s much greater. It’s a heartwarming connection shared between two people, and it bears the warmth and spirit that all of those classic holiday tunes remind us of year after year. The hard part is, when you make a habit of crafting Christmas gifts and decorations on an annual basis, what happens when you run out of ideas? Lists happen. In my last Christmas article, 10 Jar Gifts to Get You Through the Holidays, I focused on quick, thoughtful, and fun gifts for all of those cousins, second cousins, and third cousins that make up your extended family. Today’s list is a little more personal. These homemade gifts are for the men, women, and children you see every day. These crafts are cute, clever, beautiful, and exciting, and I’ve broken them down into three categories. 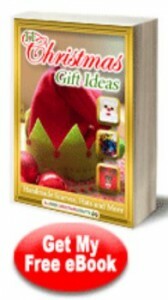 If you’re looking for even more fantastic gift ideas, check out this Homemade Christmas Gift Guide eBook. What DIY Christmas Gift Ideas have you crafted for family and friends? July is here which means that Christmas is less than 6 months away. Whether you’re ready to start crafting for December now or just want to check out your options for the next few months, the Christmas craft ideas below are charming holiday ideas that you absolutely did not make last year. 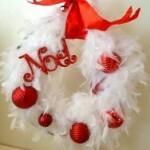 All new to FaveCrafts.com, these brand new Christmas crafts are special, stunning, and sure to impress. From tropical hues to more traditional printables, we are so excited for the following DIY Christmas ideas that we did not want to wait until September, October, or November to share them. Make sure to pin or bookmark these cuties if you’re not up for making Yuletide cheer just yet. They’ll be here when you get back. Cheery Pinecone DIY Firestarters – Give the gift of somewhere to roast chestnuts with these fire starters. DIY Pinata Christmas Trees (shown) – Add some charming textures to your Christmas home with this Anthro-inspired idea. Folded Flower Ball Ornament – This DIY ornament allows you to add summery touches to your winter tree. Merry Reindeer Art Board (shown) – Make your own DIY wall art and keep Christmas crafts on the wall all winter long. Modern Merry Christmas Printables – Lazy? That’s alright. All you have to do is print these out and hang them up. Felt Sweater Christmas Trees – These cuddly little trees are perfect for small spaces. Jolly Dotted DIY Plates – I love this insanely fast update for plain and boring plates. Dollar Store DIY Ornaments (shown) – Created in the crafting Christmas palette, these insanely easy ornaments are great for kids. 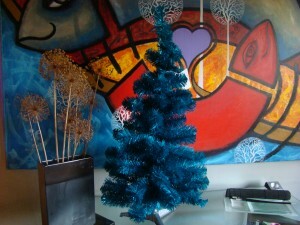 Papier Mache Christmas Trees – Unusual Christmas trees are a fab way to stand out while crafting for Christmas. If you are a responsible crafter who loves creating your gifts early (or just really want to try to be), check out our tips on how to plan your DIY Christmas gift! Reindeer DIY Wall Hanging – Rudolph would hang this in his apartment, for sure! Washi DIY Christmas Tags (shown) – A crazy cheap way to wrap your Christmas gifts up in a unique and new way. 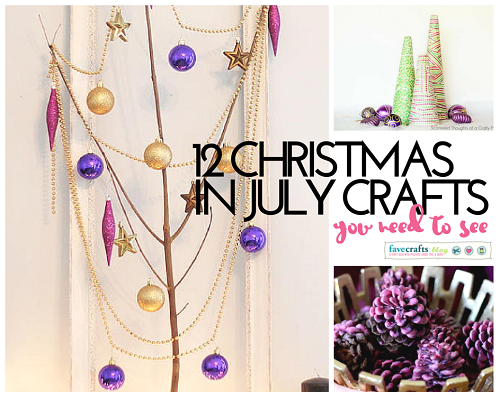 Funky DIY Christmas Tree – Add trendy ideas to your Christmas crafts to-do list this year with these charming, faux evergreens. What Christmas craft did you never get a chance to make next year? If you love free quilt patterns, then there’s nothing like putting them to use for the upcoming holiday season. Why? Well, they simply make the best DIY gifts! Who wouldn’t want to receive one of these personal and beautiful quilt designs for Christmas? We want nothing more than to hide under a soft, warm quilt during the winter months enjoying some hot cocoa by the fire. They’re undeniably amazing and an absolute necessity in the winter! 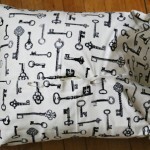 Not only do these quilt ideas make great handmade gifts, but they’re also the perfect DIY home decor project for the holidays. Hanging up a quilt pattern like this Polar Bear Wall Hanging will instantly make a room look festive. Plus, you get say you made these unique pieces! These free quilt patterns are great for a blank wall in your home. 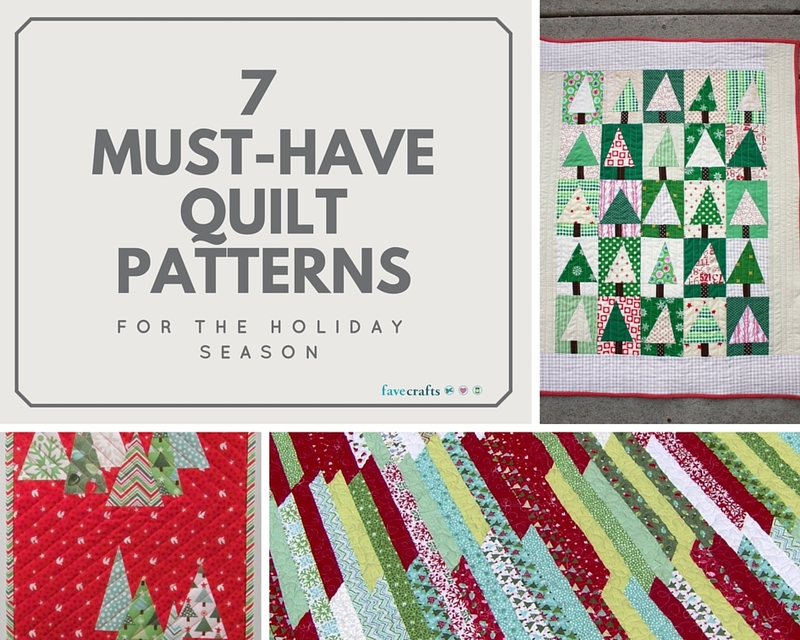 If you feel like the walls are looking bare and need some festive flair, then these quilt patterns are the answer to your dilemma. 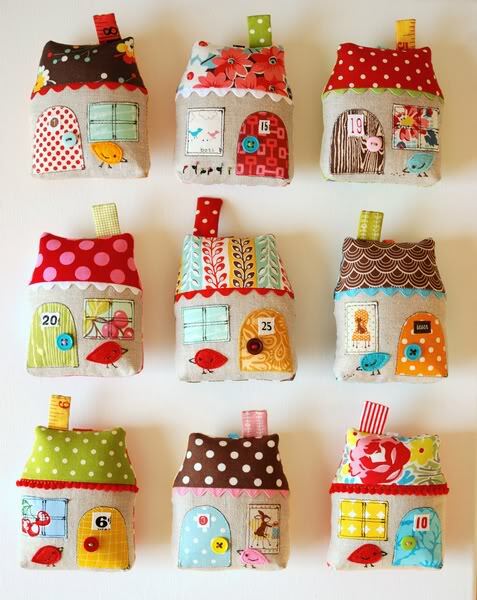 They are so full of details and creativity — they’re surely the most unique DIY home decor item anyone could make. If you’re learning how to make a quilt, then try your hand at a seasonal quilt will last you for years to come. These designs range in difficulty level, so they’re great for both experienced and beginner quilters. Feel free to use up fabric scraps with any of these quilt patterns because they’re sure to turn out special and unique no matter what. There’s no other craft project idea like a quilt: they’re one-of-a-kind pieces that will be treasured for years. Have fabric scraps? Love making DIY ornaments? These quilt Christmas ornaments are super fun and will compliment any Christmas tree in your home. 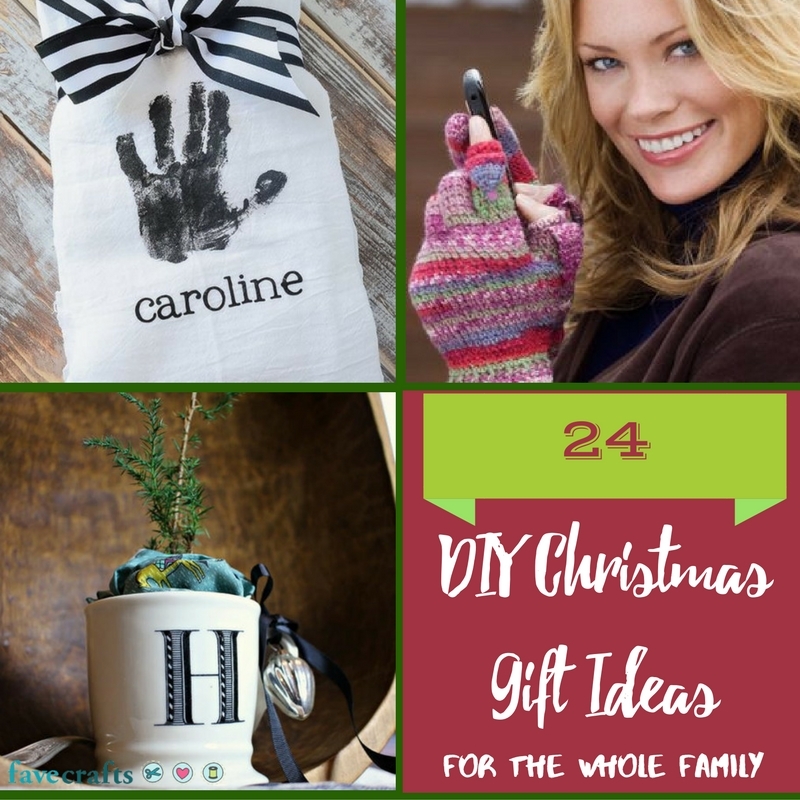 They also make great DIY gifts or stocking stuffers! Comment below and let us know, which one of these festive quilt patterns is your favorite? It’s time to get down to some serious crafting folks. With the kids back in school, the summer winding down, and the fall holidays looming over us closer and closer, we really need to prep for…Christmas! Christmas?! You’re probably thinking I’m out of my mind, but those homemade mantle crafts and DIY garlands aren’t going to make themselves! I started sewing for Christmas about a month ago because I’m still a beginner and I wanted a head start on my homemade tree skirt. Plus, I wanted plenty of crafting time and an organized craft room for all the DIY Christmas decorations I have planned. 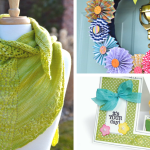 The best part of crafting — free sewing patterns, crochet patterns, and knitting — is that you can take a tutorial or a pattern and still be able to make the craft or pattern with your own personal touch. I normally change colors or patterns, but if you’re super creative, you can imagine an entirely other use. 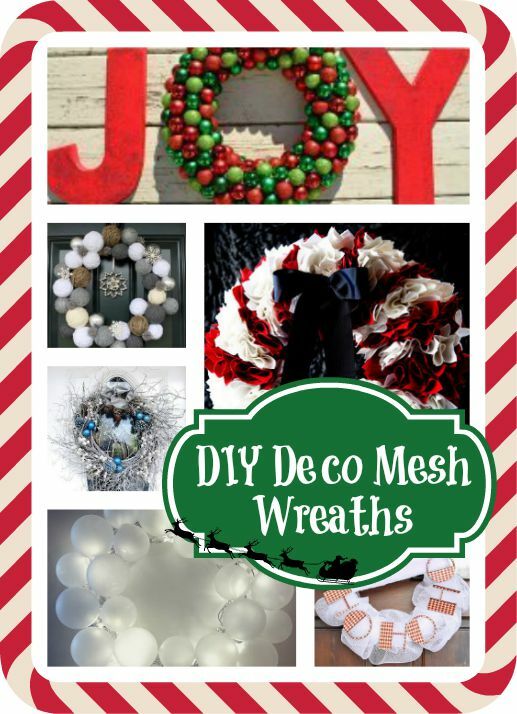 Take wreaths, for example and an adorable deco mesh wreath tutorial. That tutorial may be for spring with bright blues and greens, but you could easily adjust it for a red and green DIY Christmas wreath. Everything can be tailored to suit your needs and tastes. 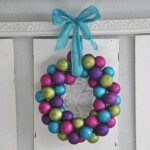 Those cute deco mesh DIY wreaths are really trendy right now. Not sure what they are? 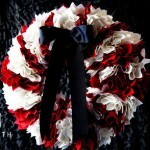 They’re the homemade wreaths that look ruffled like an unraveled roll of ribbon. These were all over my sorority hallways with the names of the sisters in each room. They had these cute wreaths with their letters at the bottom and their names in sparkly letters. 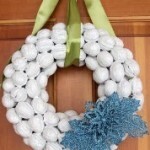 A DIY wreath would be a really cute dorm room decor to give as a graduation gift! Excited for the holidays, I’m checking my supply list twice and heading straight off to the craft store to gather supplies for a few different DIY Christmas wreath ideas. I need to make at least two to cover the whole season. 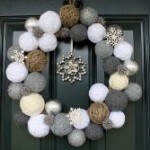 I can’t wait to learn how to make a wreath for every single one of my doors! 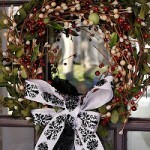 What do you use for outdoor decorations? I am a huge fan of festive attire at any time of year. 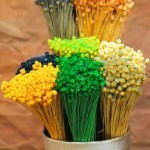 During the summer, I create wearable crafts with more color than in fall or winter. Around Halloween, I bust out the orange and black and go a little heavier on the eye makeup. At Easter, it’s pastels at all times, and pretty dresses. The same trend holds true, of course, around Christmastime. Bring on the ugly sweaters, the handmade hats, the holiday earrings. You better believe I’ll find an excuse to wear my knee-high green and red striped socks, and I’ll roll up my skinny jeans to show them off, proudly. To me, nothing says “I’m getting in the holiday spirit” like dressing up in wearable crafts. You can make great wearable crafts for the holidays when you download the 11 Christmas Gift Ideas: Handmade Scarves, Hats and More eBook! Christmas wearable crafts are perfect gifts for anyone on your Christmas list. Even if your friend, cousin, or child doesn’t love to wear handmade hats or homemade scarves, there’s always the argument of practicality. If it’s cold, you’ll need a hat. Why not make it an elf hat? If it’s brisk, you’ll need a scarf. Why not make it a Fleece Scarf with Pom Poms? It may be more than six months until Christmas, but making great handmade Christmas gifts takes time . . . especially if you’re going to try making all eleven wearable crafts in this great AllFreeChristmasCrafts eBook! Loom Knitted Santa Hats: Talk about getting in the Christmas spirit. 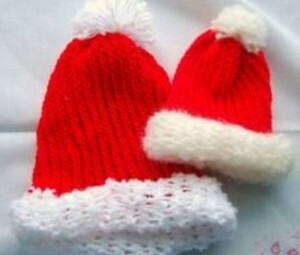 Nothing says “Merry Christmas!” like these great Loom Knitted Santa Hats. They’re festive, sure, but they’re also practical: if you live in a seasonal climate, you need to keep that head warm. Put those knitting skills to the test when you knit this great handmade Christmas gift found in the 11 Christmas Gift Ideas: Handmade Scarves, Hats and More eBook. Santa Scarf: Now this homemade scarf is just so precious, I had to share. The scarf project has you make Santa’s face and beard on one end, and the entire length of the scarf is his hat! The scarf tapers to a point, then you attach a puff ball for the pom-pom, and you have the finished product. Best of all, you don’t need to sew to make this adorable scarf because this blogger gives directions for a no-sew version as well. Find this incredibly endearing scarf in the 11 Christmas Gift Ideas: Handmade Scarves, Hats and More eBook. 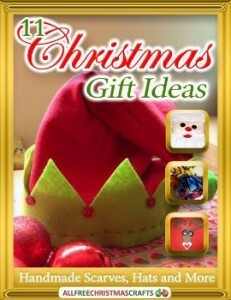 Download a copy of 11 Christmas Gift Ideas: Handmade Scarves, Hats and More; like all of our great eBooks, it’s free! 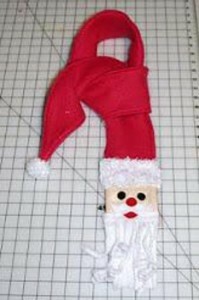 What is your favorite wearable Christmas craft that you’ve made? I’ve been around the sun enough times to have heard, “I’m not in the mood for Christmas!” I pawnder loudly with you today to suggest that maybe Christmas isn’t the problem; maybe it’s the traditions. A tradition I had was that someone special in my life would get perfume every year for Christmas. The tradition was created by us and each year when this person opened her gift, she wasn’t surprised because she had been dropping hints on the brand for a month before Christmas. Christmas lost it’s specialness and became a burden because finances change each year and perfume may be above what could be spent. We couldn’t always live up to the traditions we created so we felt like we had wrecked our Christmas by breaking from the expectations that were self created. Few people know, Daniel and I don’t exchange gifts but we will decorate the house together. It’s not pointless because winter can be an ugly time of year. Lack of sunlight, bitter cold nights and we are hibernating. Decorating the house makes the house feel cheery and bright. This year, for the first time, we are opting to have more than one Christmas Tree. We are doing five of them. I know what you are thinking now… what a stupid idea!! Our trees break tradition and are created with our personalities in mind instead of what the retailers tell us it should be. Here’s the thing, we have planned ahead and purchased the trees while they were being blown out at the end of inventory. We have been collecting ornaments for the trees and those ornaments aren’t always themed around Christmas. Michael Sellick & Daniel Zondervan Design A Black Christmas Tree. 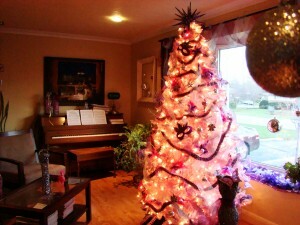 This is our tree in this picture. Purchased at Home Sense in Ontario Canada. The trees are solid black with a tall ceramic square base. It stands 6 feet tall. It is tall and narrow and prewired with lights. This tree’s appearance can be used all year long as a household decorative accessory. Using the black theme, we are doing a celebration to Divas & Diamonds. The tree will have ceramic purses, stilettos, diamond rings and other fancy colours. 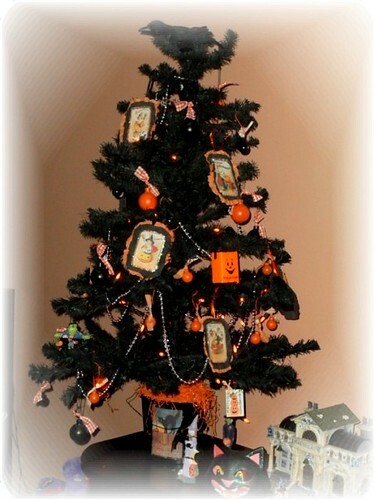 The theme of this tree with be black, gold, clear and accenting colours within the hanging decorations. This tree is relevant to our personalities as we were chosen for a reality TV show that we turned down. We had to come up with a theme for our episode and it would be a tribute to Divas & Diamonds. Purchased at Pier 1 as a Halloween tree. The tree is more sparse in branches and you can see through it. It’s the typical shape of a Christmas Tree and stands 3 feet tall. It’s prewired with Orange Lights that will be removed. This tree is going to get a black and white theme added to it. White – feathers, balls, garland, candy canes, doves, snow flakes, and popcorn. This tree will need a hand constructed tree skirt. This tree will be sitting on a jet black hutch at the front entrance of our home. 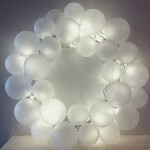 Lights will be transformed to white. Purchased at the Fyreplace & Christmas Store in Springmount Ontario Canada. It was a used Christmas tree and more than likely was a display model in a retail store. This was a custom order. This tree has the lights built in and extremely full with the branches mixed with white and pink fibres. When lit this tree glows due to the generous lights reflecting on the shiny plastic fibres. I love this tree. It causes the seniors bus, that snakes through our neighborhoods to view the Christmas decorations, to stop and check our home out. I swear I can hear heart attacks in motion with people seeing a Pink Tree for the very first time. We are doing a fun whimsical take on fairies and extreme glitter. 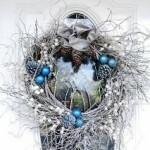 This could be in the form of twigs picked up outside, painted, dipped in glue and glitter to create accent pieces. This tree has a 20 point solid steel wire star that is really heavy. Colourful crochet Christmas tree skirt will be in order for this tree. Purchased at the Urban Barn in Ontario Canada. Stands 7 Feet Tall and really narrow. It has a shiny finish to the fibres. No lights built in. It is so deep in colour it could be mistaken as black from a distance. White lights to be added to this tree. We are looking to recreating the forest onto this tree with birds, feathers, decorated branches, insects, moss, mushrooms and bark. With the tree being so dark, virtually anything you put onto this tree will stand out. This tree is a reflection of nature and revitalization that the forest can provide. Purchased at Urban Barn in Ontario Canada. Branches are peacock blue with a shiny finish. Branches are exceptionally soft on this tree and doesn’t have a toilet bowl brush feel if you touch the branches. White lights need to be outfitted onto this tree. This tree needs some electric colours added to it which may include lime greens. Due to the colour of this tree being so bright, we feel it doesn’t need much added to it as it will take away from the colour of the tree. The tree is full and you can’t see through it. You see it sitting here on our glass table in front of our oil painting. Regardless of how you celebrate the holiday season, it’s amazing how much more exciting the holidays can be when you break from tradition. Changing up your Christmas tree once in a while can be a true conversational piece and give an entirely new look to your home.